A comprehensive, thoroughly updated edition of a classic text. 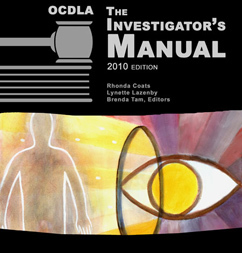 The 2010 edition is packed with new information, resources and practical tips that will benefit investigator and lawyer alike. Changes include a new chapter on infant death investigation, a chapter on computer evidence and a chapter on computer forensics. A wide variety of useful forms, letters, checklists and guides round out the manual. A one-stop shop. • 18 mylar-reinforced, chapter-divider tabs.